Titan introduced the TTC-SC07TZ(RB), a new PCI-slot VGA cooling solution that provides extra airflow to your graphics card. The product comes with two 95mm fans which can be controlled via a built-in fan speed controller, and the fans can be placed either vertically or horizontally. 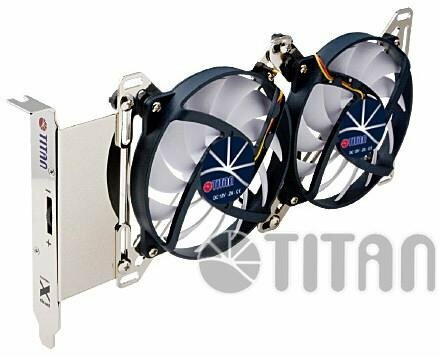 Titan's cooler measures 265 x 39 x 147 mm, has a built-in fan speed controller, and is bundled with two 95mm Z-Axis bearing fans that work at 1000 to 1800 RPM (15 ~ 27.8 dBA sound output) and can be placed either vertically or horizontally to improve airflow. The TTC-SC07TZ(RB) also supports 6, 7 and 8 cm fans. Pricing is still unknown.